iRig Acoustic Stage is the new hi-tech solution for accurately reproducting the full sound of acoustic guitars and other instruments with studio-quality sound live on stage and in the studio. The combination of its advanced MEMS microphone and hi-quality preamp and DSP processing unit provides — for the first time ever — a break-through solution that offers hi-quality natural sound, advanced features, ease of installation and a convenience never seen before. Until now, getting your acoustic to sound like it does in the studio when playing on stage has been a difficult, if not impossible, task. Playing an acoustic on stage typically falls into two scenarios: using the onboard piezo or magnetic pickup system to project a fractional representation of your acoustic’s natural warm tone, or sitting stationary on stage with microphones in “the sweet spot” on your acoustic, dramatically limiting your ability to move. iRig Acoustic Stage is a patented, revolutionary digital microphone system that makes your guitar sound exactly as if it was captured with a classic recording studio setup, giving you full rich studio-quality sound on the stage. It’s a compact acoustic microphone and advanced digital preamplifier and processing unit that recreates a studio microphone set-up providing you with all of the true character and tonal nuance of your acoustic in live playing situations. Simply clip the iRig Acoustic Stage’s microphone to the sound hole, attach it to the iRig Acoustic Stage pre-amplifier processor, then connect the preamp to your amplifier or mixer. iRig Acoustic Stage also features a “Cancel Feedback” button that gets rids of annoying frequency feedback during performance. Once installed and active, you’ll immediately hear what you’ve been missing with your traditional live setup as your acoustic tone comes alive with vibrance, warmth, depth and earthy, woody tone. If you currently perform with an acoustic-electric, iRig Acoustic Stage can greatly enhance your guitar’s live tone. iRig Acoustic Stage features an AUX input with a blend control that lets you blend your guitar’s current pickup system with iRig Acoustic Stage giving you even greater tonal flexibility and a roundness to your sound like you’ve never heard before. iRig Acoustic Stage provides an enhanced acoustic sound that's perfect for live performance and recording. Getting that "studio" sound in project or home studios with your acoustic is now easier than ever. If you have an audio interface, simply plug iRig Acoustic Stage into the analog input. No interface? No problem! 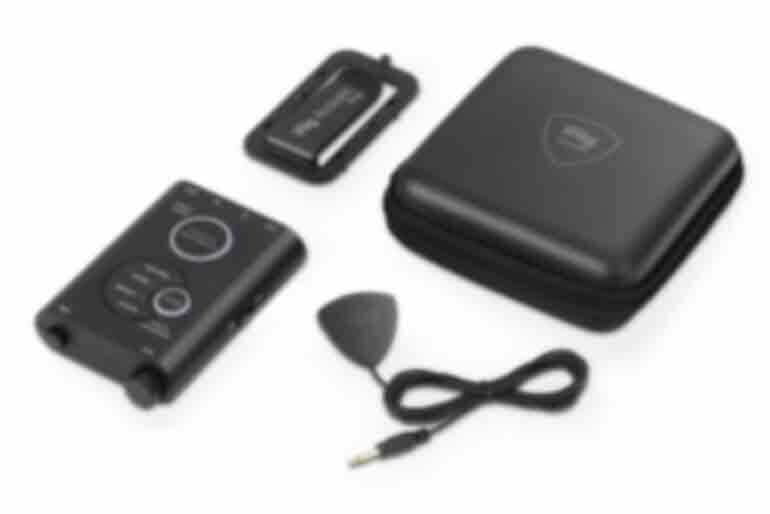 iRig Acoustic Stage also features an integrated class-compliant USB audio output for direct connection to your computer or compatible device. Not only will you get that fantastic sound, but you can also move around freely allowing you to get into the groove and capture your best acoustic performance in your studio. iRig Acoustic Stage uses a patented system composed by an hi-tech MEMS microphone and a preamplifier / processor that includes an advanced digital signal processing component performing multiple functions, from instrument calibration to EQ, to feedback cancel. The microphone that clips on to the soundhole of the guitar and captures all of the “air”, harmonics and sonic nuances of your instrument and playing style that is simply missed with traditional piezo and magnetic pickups. The synergy between the microphone and the 32-bit DSP-based preamp system provides amazingly rich, full-spectrum acoustic sound on stage like never before. iRig Acoustic Stage uses an ultra-compact MEMS microphone to capture your acoustic’s sound from the soundhole. It can be quickly slid into place in the soundhole of the instrument and easily removed with zero modification to the instrument required. 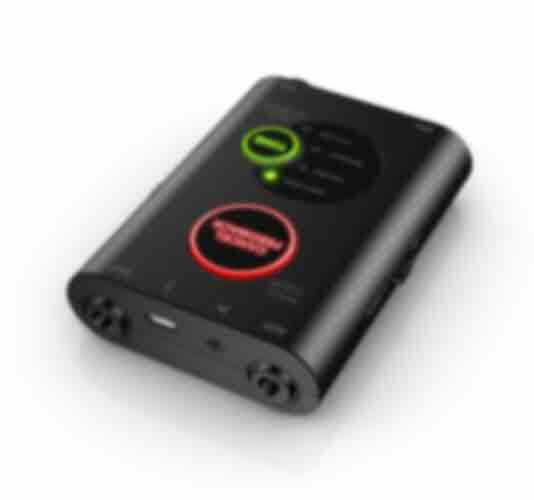 This lets you use iRig Acoustic Stage on all of your acoustic steel string guitars, classical nylon strings guitars and even ukuleles or other stringed instruments with a soundhole. The magic of iRig Acoustic Stage comes from the combination between the microphone, the preamp and the signal processing unit. iRig Acoustic Stage analyzes the incoming signal from your guitar — both the overall sound and nuance of the instrument AND the playing technique — and builds the optimum tone profile for the instrument that delivers a warm, round and balanced acoustic sound. 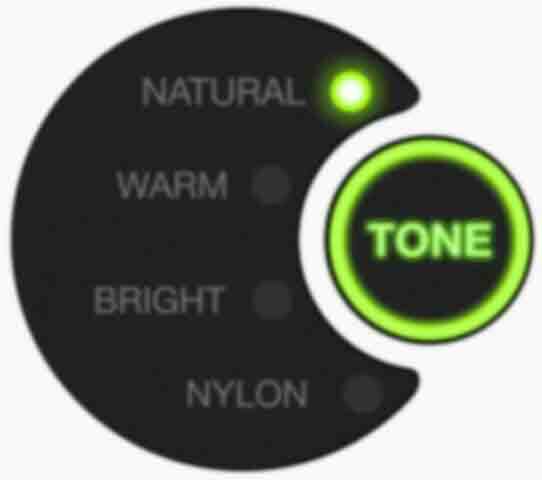 The tone profile can then be enhanced through the use of 6 selectable tone presets, depending upon the playing situation. iRig Acoustic Stage gives you 3 presets for steel string instruments — natural, warm, bright — and the same 3 optimized for nylon string instruments. The iRig Acoustic Stage processor features high-resolution, 32-bit A/D and D/A audio conversion that accurately reproduces the full range nuance, character and acoustic tonal quality of your guitar — you’ll clearly hear the tones that made you choose that guitar in the first place! Now you can get that sound everywhere you play. Out of the box, iRig Acoustic Stage is factory calibrated to sound great with most guitars. However, you can also customize the setup and calibrate iRig Acoustic Stage to optimize the overall response of the DSP specifically for your instrument, making the tone even more authentic and perfect for your guitar. The Custom Calibration feature takes just a few minutes and further refines your tone and responds more accurately to your playing style. 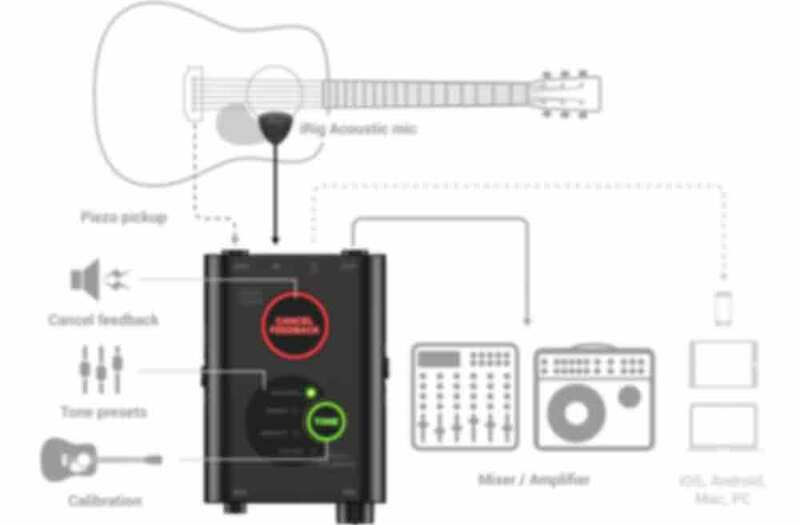 iRig Acoustic Stage also features an AUX input with a volume (MIX) control. This input is designed for use with your acoustic electric's onboard piezo or magnetic pickup. In unusually loud stage situations, the AUX input allows you to utilize iRig Acoustic Stage in combination with a piezo pickup system and blend in just the right amount of microphone signal while avoiding uncontrollable harsh feedback that can sometimes occur, even with the Cancel Feedback option active. There's also a phase inversion switch that lets you swap the phase of the microphone/AUX signal to prevent cancellation and provide the best possible sound. We’ve all been there and experienced the terror of an acoustic on the verge of feeding back and the panic of what to do next to prevent it. Quick, back down the volume… move to the right away from the speaker… get on your left toes and face the sun… whatever it takes! Playing an acoustic on stage in a live setting will almost always generate some type of acoustic feedback on stage. It’s not a matter of if, but when. Thankfully we’ve got you covered with the Cancel Feedback button — a handy “easy to reach” button on the side of the preamp/DSP unit that with the press of an oversize button quickly eliminates the offending frequency from the live sound. The Cancel Feedback feature is active for both the iRig Acoustic Stage MEMS microphone input as well as the AUX input to give you perfect acoustic sound in any setting. iRig Acoustic Stage also features a class-compliant USB audio output making it perfect for direct connection to a computer or a mobile device for plug-and-play recording in any compatible DAW or recording app. Your acoustic’s true tone, anywhere. With iRig Acoustic Stage on your favorite acoustic, you’ll finally have that warm, brilliant and full bodied acoustic sound while playing live on stage or recording in your studio, so you will sound and play your absolute best. There are many ways of reproducing your acoustic guitars’ sound, but so far none of them can combine the quality of a studio microphone with the convenience of a built-in pick up. iRig Acoustic Stage addresses this limitation with a breakthrough, advanced product with never-before seen features, with a price comparable with the most affordable solutions on the market. Read below the differences between all of the current systems and why iRig Acoustic Stage beats them all. iRig® Acoustic Stage is a registered trademark property of IK Multimedia Production Srl. All other product names and images, trademarks and artists names are the property of their respective owners, which are in no way associated or affiliated with IK Multimedia. Product names are used solely for the purpose of identifying the specific products that were studied during IK Multimedia’s sound model development and for describing certain types of tones produced with IK Multimedia’s digital modeling technology. Use of these names does not imply any cooperation or endorsement. iPhone®, iPod touch®, iPad®, Mac and the Mac logo are trademarks of Apple Computer, Inc., registered in the U.S. and other countries. App Store is a service mark of Apple Inc. Android™ is a trademark of Google Inc.